6000 Years Deception -  An epic journey of new discovery so fantastic that our natural instinct would be to block it out. Revelations for the 21st century. ​Welcome! This is the blog of a syncretic temple located in Barcelona. My research areas are the spiritual systems of all ages, metaphysics, astrology, anatomy, cosmology, true history, etymology, symbology, Gematria. My texts are based on the 7 liberal arts, which are no longer taught in universities (Trivium/ Quadrivium). ​Everybody needs to know a little about everything....otherwise we all know a lot about nothing and continue to be ruled by tyrants. The human mind has long suffered an eclipse and been darkened and dwarfed in the shadow of ideas the real meaning of which has been lost to moderns. have been adopted in ignorance and reissued as real truths directly and divinely vouchsafed to humanity for the first and only time! The early religions had their myths interpreted. We have ours misinterpreted. And a great deal of what has been imposed on us as God’s own true and sole revelation to us is a mass of inverted myths. The title of this blog entry refers to a popular song presented by Liza Minelli in the 1972 movie "Cabaret", which accidentally - or maybe not accidentally - addresses an interesting truth. To catch up on the science of money, please refer to my article here. 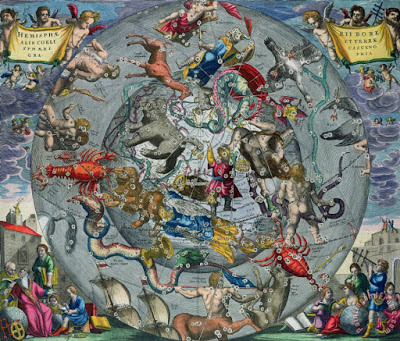 Now, the simple problem with these supposed movements is, that the constellations of the zodiac have remained the same since thousands of years. Exactly the same. No movement whatsoever. No parallax. No changes. Same stars every night. Forever and ever. Something does not fit here. And it sure as hell ain't the stars! The fiat aspect of money is based on the anagram of "fait(h)" (fiat - fait), because money has no intrinsic value whatsoever, the concept is based entirely on faith. Faith, in its negative aspect, can be equalled to belief, and belief is always based on a lack of knowledge. To know your ledge, means that as data piles up in your mind, the circumference of the imaginary data balloon gets bigger, and the outer surface of this balloon would touch more and more of the unknown around it. So the more data is shoved into and piled up in one's mind, the greater the amount of questions should become. So if you meet someone who claims to have many answers and few questions, you can skip the conversation, it will not lead to higher knowledge. Someone who has greatly expanded his or her mind, has a great ledge towards the unknown, a great know-ledge, and will be able to ask outstanding questions and thus permanently rise to yet higher knowledge. There is no way someone in human form can know all, so to be aware of this limitation makes up a great mind. Such a mind will automatically question everything, relate everything syncretically, be open and constantly investigating. Such a mind will be preparared to re-adjust or even collapse its mental house of cards at any time and at will. The world's alleged movements are purely based on belief, a mental surrogate just like money, so belief of the masses, with no knowing of the ledge. 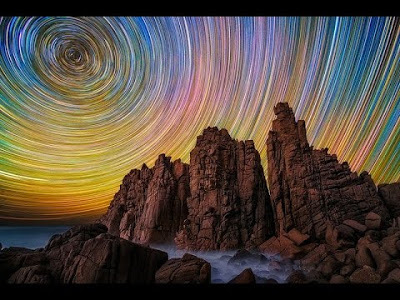 The fixed constellations alone prove to us that Earth must stand still and lie eternally peaceful and unmoveable. With any movement at all, parallax and laws of perspective would dictate that fixed constellations would be impossible. But the constellations are in the sky above us, night after night, since thousands of years and alleged billions of miles of movements in several directions. The fact is that money, specifically the old money, the occult rulers of this plane(t) Earth, are ever occupied with making this plane move in the eyes of the public. This means that all conflicts, scarcities, wars, attacks, tensions, etc are man-made, mostly intentional and designed to create a movement that otherwise would not exist. It would be impossible to rule a peaceful plane Earth with conscious citizens who know about their divine nature and realize that Earth does not move at all and that life is peaceful, people are good and that there is no disturbance to peace possible from anything else than from ourselves. Therefore, rulers need movement, chaos, relativity, turmoil, unheaval, imbalance, struggle, scarcities, fights, oppositions, .......and.....a moving ball Earth that makes us insignificant. It is old central bank fiat money that makes Earth go round, because in reality, Earth lies unmoveable and still, just like scriptures have been telling us all along. The tree rune is a symbol for life, so reversed, it stands for death. 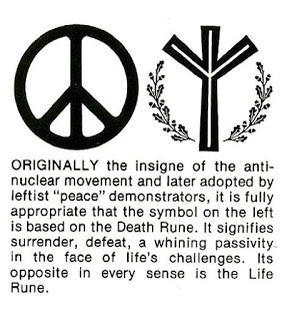 "Our" peace movement, much to the bemusement of the ruling elite, who are familiar with symbology, has been using a death rune. This hand gesture, as displayed above, is still today a way of insulting people in England. The gesture, displayed either way as shown above, right or left side, is of occult origin, and it has nothing to do with peace or victory at all, because it stands for hatred and division. ​Note the two fingers forming a "V", the two lines diverging from one single point, which symbolizes division. I have no doubt that wicked "no-sports" Mr. Churchill knew the true meaning of the symbol that he was showing to the public. ​Please refer to my blog entry on TrueStory Germany to get a taste for his war crimes. Churchill was a first class racist and absolutely hated German people. These two examples should demonstrate how we have been deeply lost in ignorance during the last Age. As the Pisces Age has now run out, it is time to start knowing and to stop believing. Be careful about what symbols you follow and use. The secret of "Quantitative Easing"
The Book of the Dead - true contents revealed!